The reasons will shock you. 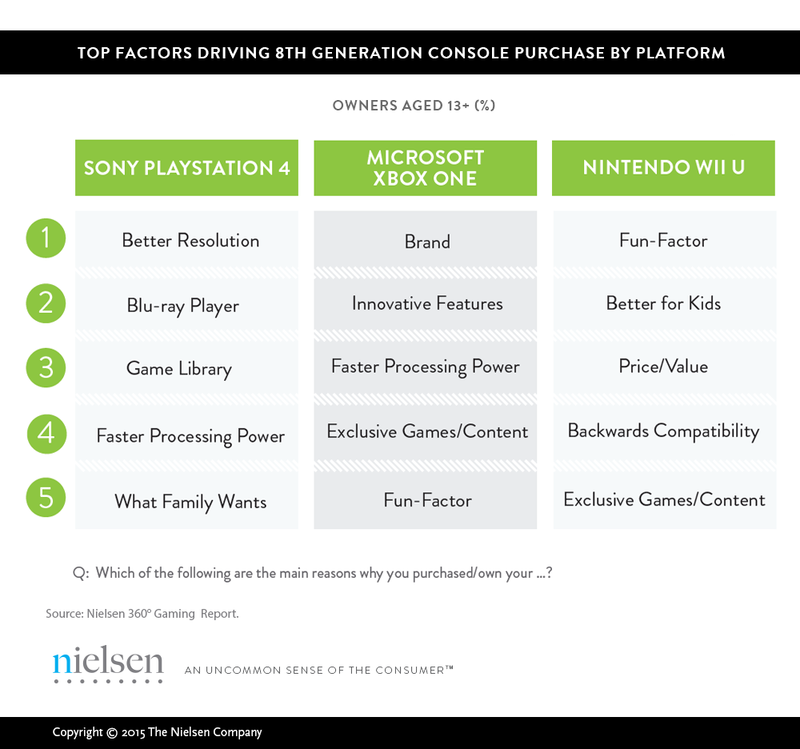 If you have ever wondered what it is at large that is driving purchases of PlayStation 4, or Xbox One, or Wii U, well, this latest survey conducted by Nielsen should answer your question. In this survey, respondents were asked what their reason for purchasing their console of choice was, and the answers were, well, interesting. For PlayStation 4 owners, the most common reason for purchasing their console was, I kid you not, high resolution games. Of course, given that PlayStation fans are so obsessed with 1080p and minor graphical details, that part does make sense; the Xbox One answer was a little surprising, as it appears that the top answer was brand value, indicating that the goodwill and brand momentum that Microsoft built up with the Xbox 360 still holds cachet. The Wii U answer was the most heartening one, though- the reason most people purchase a Wii U is because of ‘the fun factor.’ Which is, you know, what games should be purchased for. Of course, the most depressing thing about this survey was just how low ranked in general exclusive games as a reason was. I mean, come on guys, that should be your first answer to the question. Why are you buying a games machine? For the games on it.